Banksy, the renowned anonymous street artist just launched his biggest show to date. The project titled “Dismal Land,” a “Bemusement Park,” has been staged in a run-down site home to a former outdoor pool in southwestern England’s Weston-super-Mare and includes works from Banksy, as well as art galleries featuring some 50 international and British artists including Damien Hirst, Jenny Holzer, David Shrigley, James Cauty, and other lesser known artists. Dismal Land features dark, amusing exhibits like a sculpture of a woman attacked by a cloud of seagulls, a pond where visitors can steer model boats crammed with migrants, and a dead Cinderella hanging out of her crashed pumpkin carriage surrounded by paparazzi. The dystopian theme park also showcases 10 new never-before-seen pieces from Banksy, including this one featuring an orca leaping from a toilet bowl to jump through a hoop, held by a trainer, with a kiddie pool awaiting the whale’s landing. This simple, yet effective piece of art is yet another powerful punch delivered to the already suffering SeaWorld. As the film “Blackfish” captured, orcas do not belong in captivity at theme parks like SeaWorld where they are trained to performed ridiculous tricks for our entertainment. In fact, orcas are incredibly social and intelligent animals and living in concrete tanks does not provide them with the stimulation, exercise and enrichment that is naturally offered in the wild. SeaWorld may attempt to sell us fairy tales of how orcas benefit from doing their shows, longer lifespans in captivity, how larger enclosures is the answer, as well as their conservation and rescue and rehab programs but the truth is orcas are not meant to be confined in concrete pools. 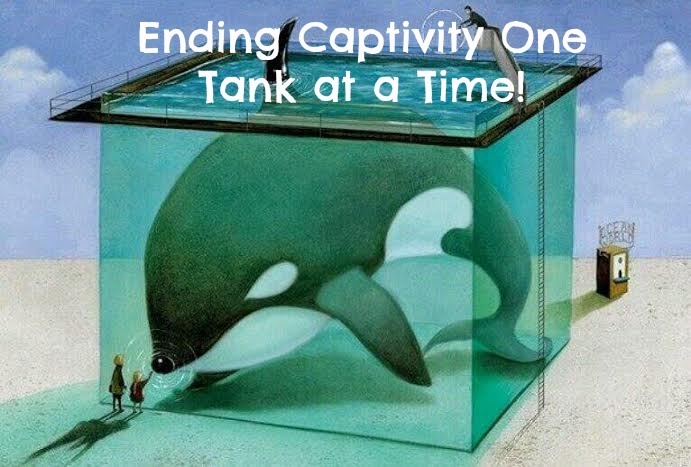 Just think about it … how can it possibly be okay to keep a twenty-thousand-pound orca that is used to swimming an average of 100 miles per day in a concrete tank that is smaller than the parking lot for visitors at SeaWorld? You don’t have to be a cetacean expert to conclude that these majestic animals belong in the open ocean and not in toilet bowls at SeaWorld. This is the unfortunate reality for captive animals across the board – whether in zoos or marine parks, and to make matters worse, training orcas to perform tricks for our entertainment is literally as unnatural as trying to get a whale to jump out of a toilet bowl into a kiddie pool. Get familiar with the facts about the life of Orcas in captivity vs. the wild and spread the word so that marine parks like SeaWorld that keep animals captive for our entertainment eventually become relics of the past. Featured below are some other iconic pieces of art depicting the sad lives of orcas in captivity.